"Ways of a Woman In Love"
Most Country and Western Music programs tried to create the image of an old-fashioned barn dance over the air. The barn dance was an important social event in rural communities. After spending the week working from sunrise to sunset all week long, the hired men on the biggest farm in the county would move the animals out of the barn and stack the hay bales around the sides of the building. This left a large open space for dancing, and at one end a stage would be constructed, often by dropping a few planks over a stack of hay bales. The dance itself was a lot of fun, but a relatively mild affair. The fiddle and guitar players were local farm boys, and if the music wasn't always good, it was played with enthusiasm. The party couldn't go on too late. It might be the end of the work week, but everyone had to get up early Sunday morning for church. The Live Town Hall Party featured a different kind of country music. This was not the music of the barn dance; it was the music of the Honky Tonk. The listeners here were not working in the fields all day. These were men who had left the farms for the big city where they worked just as hard or harder, and at the week they were handed a paycheck which may not have been a big as they deserved, but the local honky tonk was there to separate the men from as much of their paycheck as they could. The music had to remind the hard working men of home, but it was expected to be better than what was played at a barn dance. On the edition of The Live Town Hall Party presented here featuring Johnny Cash, it was. Johnny Cash was born in Arkansas, 1932, the fourth of seven children. Cash was working in the cotton fields and singing with his family by the time he was five. The family farm was flooded out at least twice, inspiring his song "Five Feet High and Rising", featured in this set. The Cash's were church-going folks, and Johnny was deeply affected when his older brother Jack died as the result of a mill accident. He had learned to play guitar from his mother and developed an appreciation for Irish folk songs by listening to Dennis Day on The Jack Benny Program. Johnny's given name was J.R., but he adopted John R. when he joined the Air Force in 1950 because the service would not accept initials as a first name. He was shipped out to Germany as part of the 12th Radio Squadron and he worked as a Morse code operator monitoring Soviet military transmissions. Cash was one of the first radio operators to hear the news of Joseph Stalin's death. He received an honorable discharge in 1954 as a staff sergeant and married his longtime girlfriend, Vivian Liberto. The young couple moved to Memphis, Tennessee, where Johnny sold appliances while studying to enter a radio career. He played guitar with friends Luther Perkins and Marshall Grant who introduced him to Sam Phillips of Sun Records, the same label where Elvis Presley began his career. In 1956, his first number one record was "I Walk the Line". 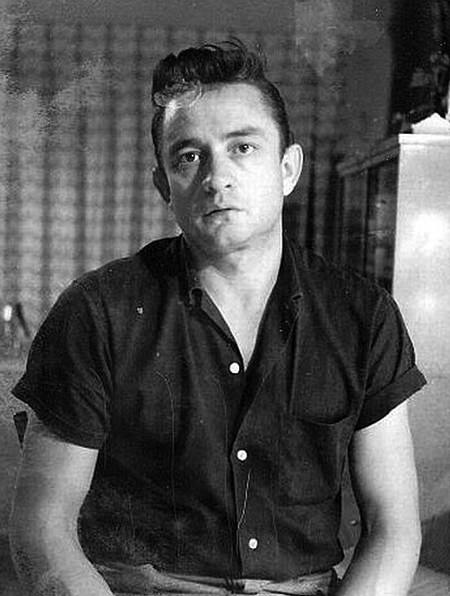 As the decade progressed, Cash left Sun Records to sign with Columbia, performed at his first prison concert (at San Quentin in 1958) and had begun to drink heavily in reaction to the pressures of touring. In 1959, when Live Town Hall Party was broadcast, Johnny Cash was on the cusp of Country Music Super-Stardom. He is still a little rough around the edges, but he had not quite developed his reputation as an outlaw singer yet. He was already performing in a black costume, but it was yet to become a political statement (he chose black when other country acts were favoring rhinestones and white ten-gallon hats because the black was easier to keep clean on the road). Live Town Hall Party is a must for any Johnny Cash fan. Be the first to comment on "Live at Town Hall Party"